You don’t have to travel all the way to Mexico to get a good taco. Or even to Baker. Some of the best places to get your shell stuffed are right here in Las Vegas. So put down the burger, think about the amalgamation of deliciousness that is sour cream, guac, and carnitas, and check out the 15 best damn taco places in Las Vegas. 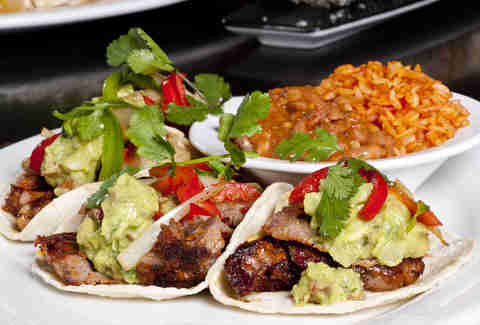 The street tacos come in a few varieties, such as Baja shrimp or pork carnitas, but the carne asada tacos could be the best fuel for a long night of prowling on the Strip. And go easy on the infamous Cabo Wabo tequila, which can all too easily be confused for a condiment, rather than a drink. This family-owned business recently closed its only Strip location, but continues to operate in North Las Vegas and in the east valley on Charleston. Either way, you still have decades of tradition poured into some of the most authentic Mexican food you’ll find in Las Vegas, not to mention at least 10 meat options for your taco. Keep things simple with the carne asada or for something a little more adventurous, choose the cabeza taco, made with meat from the head of the cow. You’d expect a restaurant that offers a blend of Chinese and Mexican cuisine from Chef Jose Andres to have more than a few fun things on the menu. 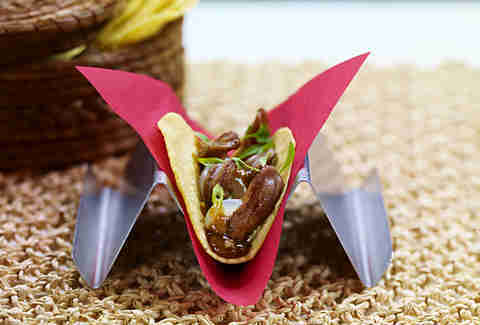 The Silencio tacos will keep your mouth full and one unlucky duck very quiet. They’re made with duck tongue and fresh lychee. Like everything else at Braddah’s, the tacos are made to your own personal specs, so choose wisely as you line up at the counter and order. It’s hard to beat the fish tacos, perfectly cooked and smothered with your choice of Hawaiian-inspired toppings, including a sweet charred pineapple verde salsa. It’s almost a taco but not quite. 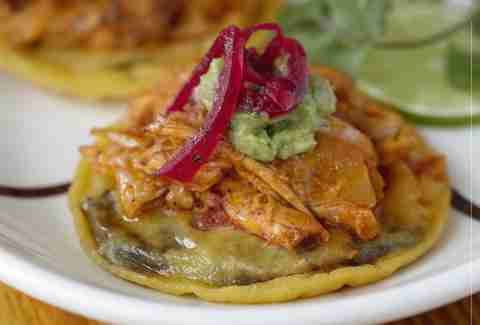 The chicken panuchos lay grilled citrus chicken, guacamole, and pickled onions flat on black bean-stuffed tortillas. KoMex Fusion started out as a family-owned market where the employees would mix up Mexican flavors with Korean meats for their own lunches. The food ended up on the regular menu and quickly developed a loyal following. 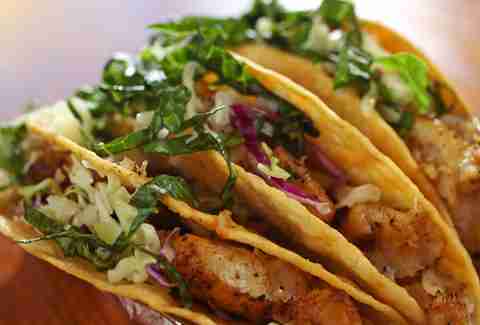 The best version of the Fusion taco comes with pork belly mixed with slaw and pico de gallo. 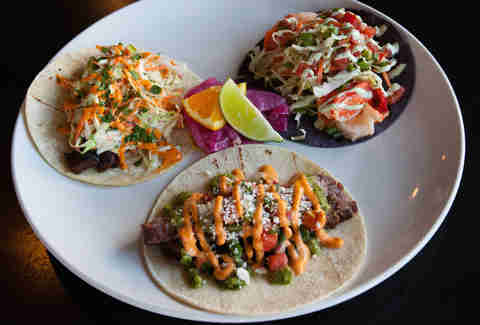 The Urban street tacos are for people who have a hard time with decision-making. Mix and match your choice of steak al carbon, carnitas, and butter-poached lobster and shrimp. Need a little more beef in your taco? Trick question. Of course you do. Hussong’s serves a mean ribeye taco. It comes with guacamole, jalapeños, onions, red bell peppers, cilantro, and bigger-than-you’d-expect chunks of steak. If you prefer your tacos with outdoor patio seating, a second location opened over the summer in the Boca Park shopping complex near Summerlin. Mercadito has a few ways to fix a seafood craving. 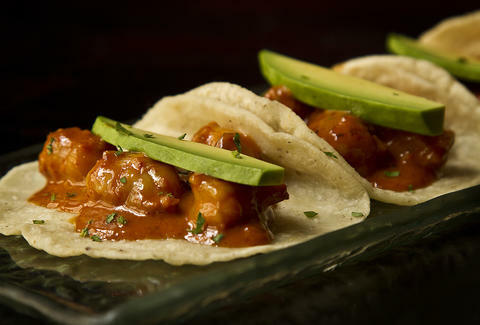 The camaron taco is stuffed with shrimp, roasted garlic, avocado, and chipotle mojo. 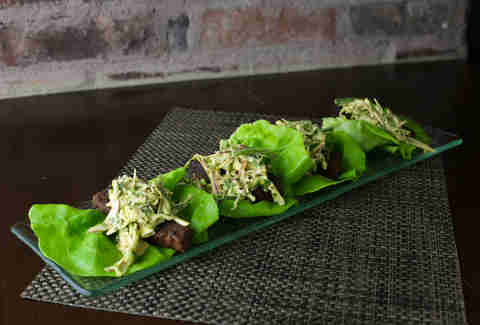 But the healthier option could be the Espada, which includes blackened swordfish, spicy aioli, and cabbage-jalapeño slaw with the option of Bibb lettuce in place of that carb-heavy shell. Not only does El Dorado Cantina share real estate with Sapphire Gentlemen’s Club, it also stands apart from the other taco joints by going GMO-free and organic with its ingredients. 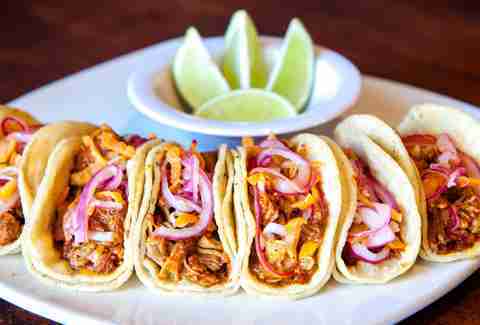 So put your health first with a gluten-free cochinita taco but pay in cash and get some singles in change before checking out the entertainment next door. 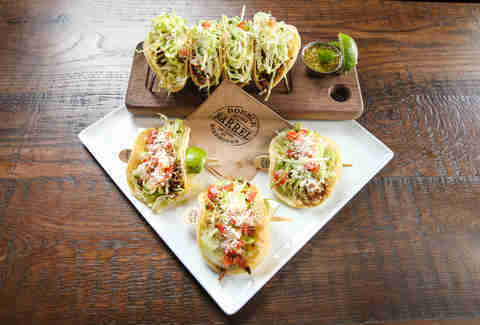 For those looking to bulk up on protein, the recently introduced DB street tacos come filled with your choice of wood-grilled steak, smoked pulled pork, or wood-grilled chicken and are topped with avocado creme, pico de gallo, lettuce, and cotija cheese. There’s no need for a gyro when you can just get the same thing on a taco. The gyro tacos are loaded with lamb, tzatziki, cucumber, and tomato. 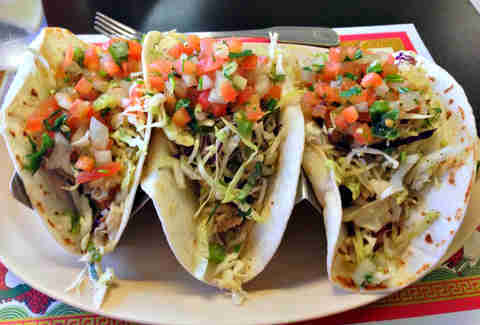 They're also among the best taco values in Vegas since three come in a serving for just $10. 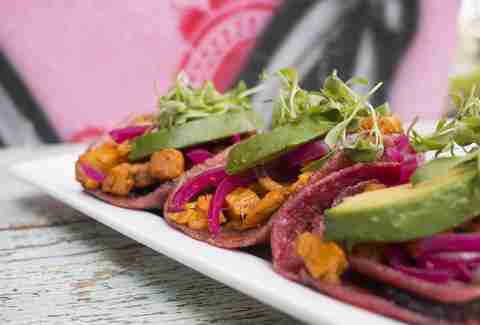 The pink tacos at Pink Taco come with made-in-house pink corn tortillas, beans, grilled chicken, salsa arbol, pickled onions, avocado, and no shortage of hilariously inappropriate jokes to be made at their expense. 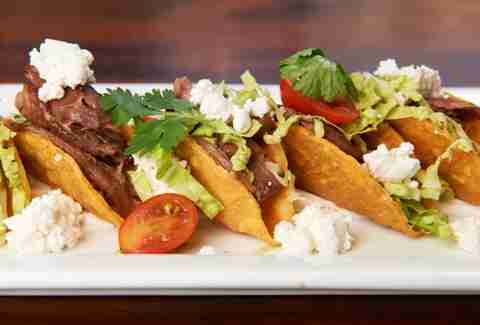 The mini duck tacos are packed with feta, tomato, Napa cabbage, tomatoes, and tomato-cilantro cream. They’re all-natural and can be found in small portions on the tapas menu, leaving you with plenty of room to try a few other things as well. And by a “few other things”... we mean the roughly 25 choices of wine by the glass. 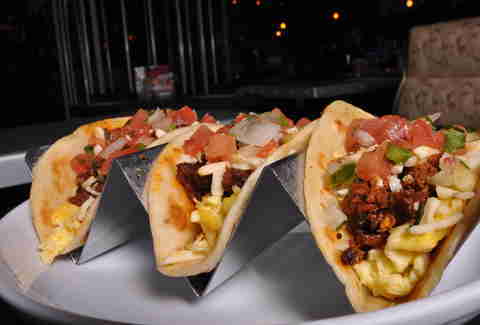 The Rockhouse may offer the best taco deals in Vegas with 10 different kinds of street-style tacos starting at $1.50 on Tuesdays, but the brunch offers an even better reason to try one. 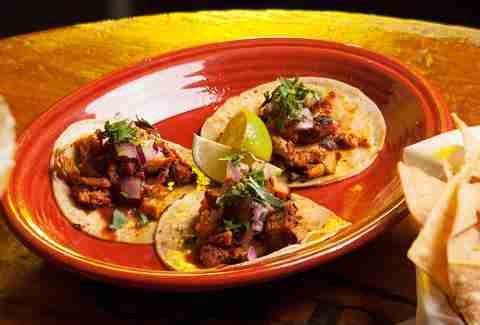 The chorizo & egg tacos come topped with pepper Jack cheese and pico de gallo on flour tortillas. If you just woke up and are craving tacos... come here. Rob Kachelriess may or may not have once put ketchup on his tacos. Follow him on Twitter: @rkachelriess.